Portugal has the fifth highest corporate tax rate in the developed world, at 31.5 percent, but not for long. 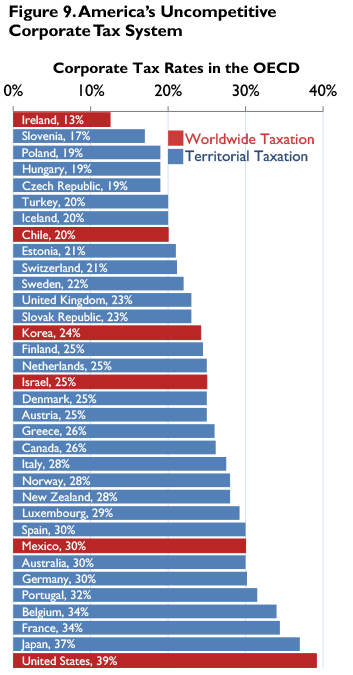 According to Tax-news, Portugal plans to reduce its corporate tax rate 2 points next year and eventually 7 points to 24.5 percent by 2016, which would be just below average in the 34 member OECD (see first chart below). However, this average keeps on getting lower as developed countries continue to compete for corporate investment (see second chart below). Meanwhile, the U.S. hasn’t cut its corporate tax rate since 1986, and it’s now the developed world’s highest rate at 39.1 percent including federal and state corporate taxes. As Portugal exits the high corporate tax club it leaves only the U.S., Japan, France and Belgium with corporate tax rates above 30 percent. And Japan seems likely to reduce their rate in the near future, potentially below 30 percent. Another important aspect of the corporate tax is how it applies to foreign earnings. Virtually all developed countries use a territorial tax system that exempts to a large degree foreign earnings from domestic taxation. The U.S. is one of only 6 developed countries that continues to subject foreign earnings to domestic taxation, and the only country to subject those earnings to a tax rate above 30 percent. 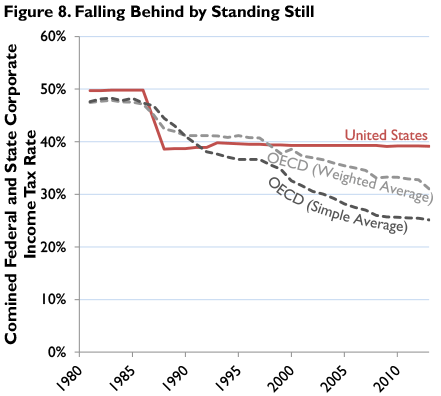 The U.S. clearly has the most punitive corporate tax system in the developed world. No wonder corporations are holding back on investment and hiring plans in the U.S., and instead moving to other, more hospitable, tax regimes.